Due to the profundity of Godse’s speech, on this occasion I’d prefer to make my introduction as brief as humanly possible. Although I am in no way condoning Mr Godse’s actions, anyone that grasps just how grave a threat Islam is to the western world will understand the Hindu martyr’s reasoning. You may even rethink how you view Gandhi and all that we’ve been taught about Indian independence, after reading the courageous Brahmin’s words. 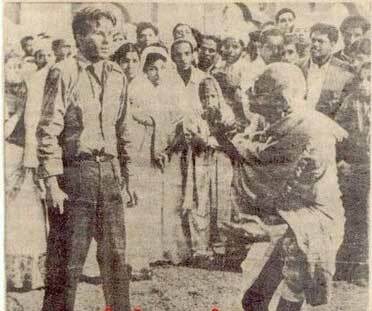 Please be sure to keep those figures in mind when reading Godse’s speech, and when evaluating Gandhi’s legacy. Gandhi sold out to dark forces, permitting Islam to divide the Indian subcontinent in the same manner globalists, Zionists and Islamists are doing on our soil today. Firstly, I’d ask that each and every one of you gets your arse up from behind your computer and does something today. There’s no more time for cowardice and apathy. Secondly, the EKP confronts ALL enemy ideologies. Should I ignore Islamism because someone else brought it here? The racist anti-western desert ideologies espoused by both the Pharisees & Jihadists were cut from the same proverbial cloth, born in the same sandbox and are of the same innate hatred. There’s NOTHING AT ALL in my humble opinion that differentiates them from one another. Make no mistake, both the Pharisees and Islamists despise our Christian and Western culture with equal levels of loathing – and work in unison to harm us. The former just do a better job hiding it. From their shared aversion to dogs and pork, to the manner in which they cull their livestock and ritualistically circumcise their children – the commonalities run as deep as the ocean, and differences, as shallow as a summer puddle. So, without further ado, your wake up call of the day!